Teach a kid to build a boat, and they learn much more than the physical skills. 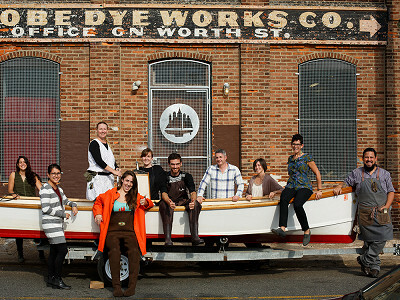 At The Philadelphia Wooden Boat Factory, urban teens learn by doing. They get hands-on boat-building sail-fabricating experience, while they hone their problem solving, communication, and collaboration skills. The boat-building is a means more than an end. PWBF’s approach is strength-based, building off the teens’ fortitude. Having a sense of responsibility helps them develop essential life skills, shape a more positive self-image, and even refine their academic skills. The team at PWBF brings a wide range of expertise (e.g., marine ecology, sociology, special education, social work) and creates a nurturing environment. The ultimate goal is for teens to develop the habits of mind, discipline, and self-confidence to tackle challenges. If not for PWBF, many of these kids wouldn’t have sailed the coast on a boat. But even more importantly, they might not have believed they could build one. Hi Grommet fans! 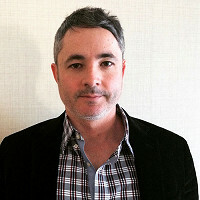 I'm Brett Hart, Executive Director for Philadelphia Wooden Boat Factory. We're so excited to share our story with The Grommet. 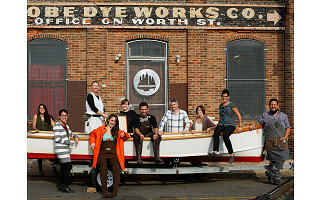 How is The Philadelphia Wooden Boat Factory different from other youth empowerment organizations? @Emily Philadelphia Wooden Boat Factory traces its lineage back to the end of the age of commercial sail, a time when ship owners began engaging young men in search of character building experiences in trans-ocean passages as apprentice crew aboard great sailing ships. Our staff all have a love for their craft, no doubt, yet our success comes from a recognition of what our work as mentors truly requires. We all have committed to understand this work. We employee a staff of social workers who bring the research informed lens in the field of positive youth development. Together we have re-established our set of mentoring instincts by reinforcing them with approaches rooted in this research and practice. Most importantly, we provide unconditional, supportive love for our students, such that they feel safe in taking risk, making mistakes, recovering from failures, and trusting constructive feedback. Besides boatbuilding, what are some of the hard skills the youth at PWBF are learning? PWBF offers three distinct apprenticeship opportunities; Traditional Wooden Boat Building, Sail- Making and Sailing, and Riverine Sciences. Each apprentice understands that in building their acumen in their craft that they are simultaneously making a meaningful contribution to others within the agency and community. For example; boat building apprentices are building small sailing crafts for our student RiverGuides, who are in-turn providing on water educational opportunities for their peers in the community. We recognize that it is important for youth to have opportunities to make authentic contributions, and what better contribution could there be than being important in the lives of others? What would you say characterizes the environment at the PWBF? We strive to assure that students feel seen, and recognized for being their amazing selves. We want to affirm them, and encourage them to be their own best self-advocates, knowing all the while that they have the support of their peers and mentors, unconditionally. For sure, they are the experts in their lives, and have much to teach us about the world, as well as our approach to being mentors. We can share with them our love of the maritime arts, our curiosity about the natural world, and or thirst for adventures, of all shapes and sizes. How do you create a nurturing atmosphere? The atmosphere begins with staff self-care, and support. We support our staff to be their best selves for our students by doing everything in our power to help them be prepared for what can be taxing and emotionally demanding work. Our team of social workers provides the staff professional development support, facilitates bi-weekly case counseling team meetings, provides weekly individual staff supervisions, and is a communication conduit between direct service and administrative staff. The result is a healthy staff environment, high staff continuity—and downstream—a safe and supportive atmosphere for students who have experienced a myriad of personal traumas in their lives. What are some of the ways in which you hope to grow/expand? Our goal for the near future is to expand our ‘community yacht club’ which currently consists of a couple shipping containers used to house our growing fleet of student built craft, and a small building that we share with the landscapers of our local on-water park. Teach a kid to build a boat, and they learn much more than the physical skills. At The Philadelphia Wooden Boat Factory, urban teens learn by doing. They get hands-on boat-building sail-fabricating experience, while they hone their problem solving, communication, and collaboration skills. The boat-building is a means more than an end. PWBF’s approach is strength-based, building off the teens’ fortitude. Having a sense of responsibility helps them develop essential life skills, shape a more positive self-image, and even refine their academic skills. The team at PWBF brings a wide range of expertise (e.g., marine ecology, sociology, special education, social work) and creates a nurturing environment. The ultimate goal is for teens to develop the habits of mind, discipline, and self-confidence to tackle challenges.